Celebrating the life and work of Suzanne Aubert, social and religious pioneer and champion of children and the poor. During her life, Mother Aubert, as well as founding a religious congregation, greatly influenced progress in such areas as health, education, women’s rights and social welfare. Her work in the fields of medicine, Maori language and an evolving New Zealand spirituality was pioneering and far-reaching. The first event in the Festival is For Compassion’s Sake: an art exhibition. 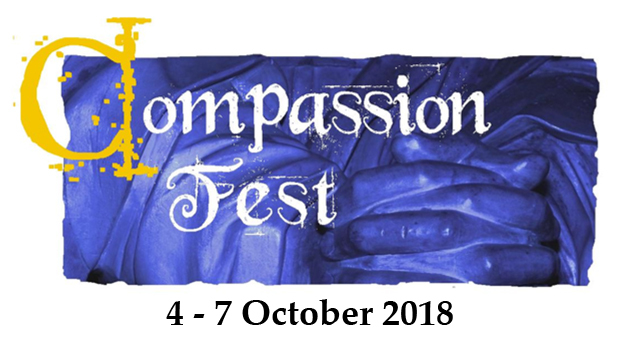 This will be running the week leading up to the festival in the Island Bay Presbyterian Church lounge, contributors have been invited to submit work illustrating either the life of Suzanne Aubert or the virtue of compassion. Some work will be for sale, it will be open for viewing each day. The formal exhibition opening will be 4-6pm next Sunday, refreshments provided, all welcome. The first formal event of the Festival weekend is a Taize service as CompassionFest opens in reflection and with prayer. This is at the Home of Compassion chapel, 7-8pm Friday Oct 5th. The Heritage Center will also be open that evening from 6:30pm if people wish to immerse themselves in Suzanne Aubert’s life. “For Compassion’s Sake” Art exhibition: Showcasing the artistic vision of Compassion in 2D and 3D media. Presbyterian lounge, 88 The Parade. Opening: Sun 30 Sept 4pm. Until 7th Oct.
“Small steps in big shoes” – Children’s tour of Home of Compassion. Walk up with trolleys and food donations to the Home; be guided through a Mother Aubert ‘experience’. Sat 6 Oct. Leaves the church 2.10pm; tour 2.45-4pm. “Suzanne’s Island Bay” Mother Aubert knew her local community inside out. Take a 1900’s trip with the Historical Society. Baptist church, Sat 6 Oct 5pm followed by soup for all ($2 per cup). Combined Church Service: Contemporary combined worship service, celebrating the life and legacy of Suzanne Aubert at Presbyterian church. Sun 7 Oct, 10am. What’s Compassion got to do with running a Country? A symposium with politicians and theologians – feat. Hon. Paul Eagle, Hon. Chris Finlayson, Prof Chris Marshall, Janna Dennison and Sister Catherine Hannan at H.O.C. Sun 7 Oct, 7:30pm.